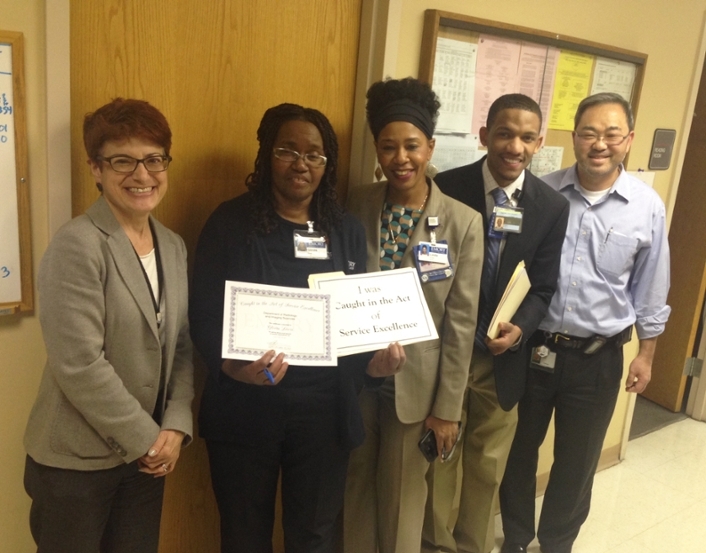 Dale Walker, Director of Strategic Initiatives and Joy Eberhardt Senior Medical Secretary were caught in the act by displaying thier Service Excellence to collegues and patients. Gloria Lewis, Patients Accounts Represenative, took quick action to avoid a service failure and went above and beyond to help a patient. The “Caught in the Act” program is designed to recognize noticeable acts of service excellence for which an individual or a team goes out of their way to exceed the expectations of a customer (internal or external). 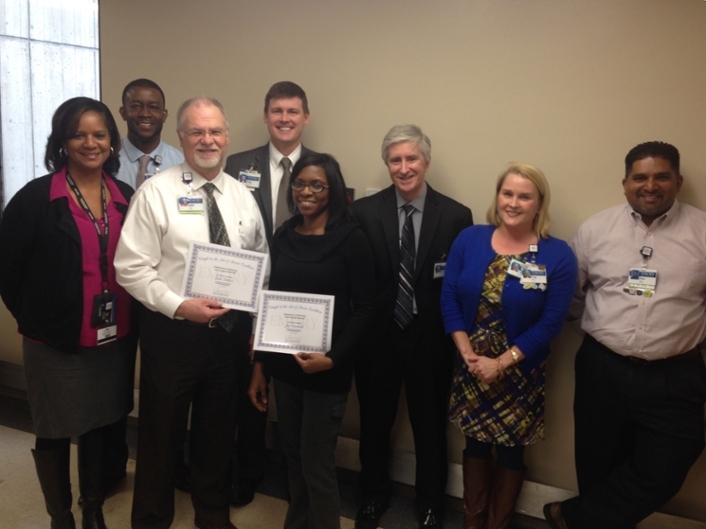 In February and March 2015, three employees were recognized for going above and beyond in support of service excellence. Earlier this year, Gloria Lewis, Patient Accounts Representative, took quick action to avoid a service failure. When a patient checked in to Nuclear Medicine for an I-131 treatment, Gloria noticed that the patient was also scheduled to have a PET scan later in the day. She knew that the I-131 treatment would have precluded a high quality PET scan. When Gloria noticed the critical oversight, she quickly informed Dr. Lee prior to the patient’s treatment. Had Gloria not intervened, the opportunity to do the PET scan would have been lost and we would have asked the patient to reschedule and return another day for the scan. Many thanks to Gloria for making “the catch” in support of excellent care delivery. Tomosynthesis for 3D breast imaging. With an approved budget that was enough to acquire tomosynthesis technology for one location, Dale found a way to get the technology implemented at two sites (both Breast Imaging Centers at Clinic C and EUHM). For thousands of breast imaging patients each year, offering the new technology means a more accurate screening exam, thereby reducing the number of anxiety-provoking patient call backs. Radimetrics, a radiation dose measurement system that assists with our radiation dose reduction efforts. Again, the approved budget for this important software implementation was going to (at best) cover the CT scanners for EUH, EUHM, EUOSH, and TEC. Drawing on his experience, diligence and creativity, Dale made it possible to acquire the software for all scanners across the system to include ESJH, EJCH and Emory Clark Holder. This year, across the system, we expect to perform more than 130,000 CT exams. With the implementation of the Radimetrics system, we will be better able to provide safer, patient-centered care to all our CT patients. Neuwave - a cutting edge ablation system that more effectively and safely treats our patients. There was initial uncertainty about whether we would be able to acquire the technology, but Dale worked to get the technology in place at both EUH and EUHM. Now our patients benefit from safer and more effective treatment. Joy Eberhardt, Sr. Medical Secretary, was recognized after a patient informed us about how Joy went above and beyond to provide outstanding customer service. According to medical criteria, the prostate cancer patient was not a perfect fit for an MRI-guided procedure. However, Joy took the initiative to work with Dr. Nour to make a better determination of the medical value and appropriateness of the procedure. In a recent Press Ganey patient satisfaction survey, the patient stated, “I would not have been [an Emory] patient if it were not for Joy. I became not just a patient, but a cancer-free patient who is telling everyone I know about my positive experience. I will be forever grateful.” In a separate letter, the patient’s wife specifically recalled her interaction with Joy, stating that “she is professional and knowledgeable, as well as compassionate. It was obvious we were not just another number passing through her busy day but she really cared about us.” Many thanks to Joy for her ongoing contribution to our culture of service excellence.